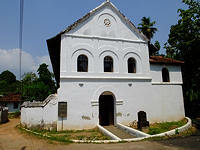 Next day we started the Muziris Heritage tour. 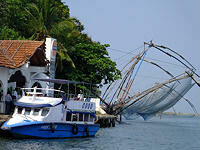 This day tour begins from Kochi harbour by catching a local ferry to Vypeen Island. The 5-10 minute ferry ride with the locals and their lorries laden with goods is fun and allows a good view of Fort Kochi.The elegant white buildings of the Brunton Boatyard Hotel stand out, on the waterfront next to the ferry jetty. On this heritage tour we visited the Marthoma Church, the Chendamangalam Synagogue, Paliyam Dutch Palace, 1000 years old Shiva temple and the Handloom Weaving Centre where men and women of the local village are weaving for many hours a day producing many beautiful fabrics. Next we visited the St.Thomas church dating from 52 AD by the fishing harbour. Lunch was included at a local hotel restaurant with chicken and fish curries. The fish curry remains the best one we have tried throughout our 14 day trip. After lunch we went to see the remains of a Portuguese Fort, which is an archeological 'dig' This is a very pleasant walk along the riverside with Chinese fishing nets to be seen on the left and the remains of the Fort on the right. We drove back to the ferry and crossed back to visit and inspect the Brunton Boatyard hotel. As the name suggests it is situated along the harbour front with wonderful views of Kochi city, and is converted from a boat yard. The reception area still retains all the old style including 'punkahs' suspended from the ceiling all along. The elegant white buildings housing the rooms are built in the same style, with courtyard gardens and shaded verandahs. A delightful tearoom is set for afternoon tea. All the rooms have balconies and face the the sea. A lovely 'infinity' pool is situated by the waters edge. All the rooms are large with elegant, traditional design. The dining room is beautiful with lovely food which we sampled that evening. We have had many clients stay here before and we will continue to use Brunton Boatyard in our Deluxe hotels category. 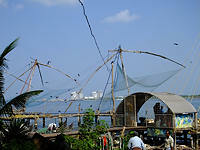 Next day took a tour of Fort Kochi. Starting from the Fort Kochi harbour, it is a very enjoyable walk along the waterfront with fishing boats parading underneath the walkway and many Chinese fishing nets on display. Birds were flying all round for any leftover catch from the fishermen. We were there in the morning when fishermen were still loading their catch of the day to the fish stalls along the harbour front. It was Easter Sunday. Walking off the waterfront on the other side of the centre we came to some lovely tudor style colonial buildings along the street leading to the famous St Francis Church built in 1503, and then the Santa Cruz Basilica also originally built around the same time. Afterwards we visited the famous Dhobi Khana laundry collective where clothes are washed by hand by beating on stones. 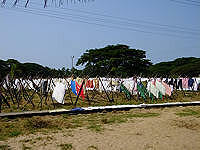 If you have your clothing washed and ironed in Kochi it will definitely come back from here. Later that day we moved to our new hotel for one night - the Old Harbour. This is another delightful three hundred year old Portuguese heritage building. Compared to the Brunton Boatyard this is more of a boutique-style hotel. The hotel is beautifully furnished blending traditional style with the modern. The garden is beautifully laid out, with a swimming pool at the rear. Our room was the Princess suite which is as large as a one bedroom apartment and has a balcony overlooking the square and park opposite the hotel. There are also newer garden cottage rooms in the garden. 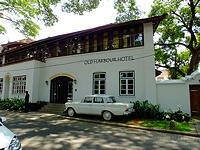 We are also using this hotel in our Deluxe hotels category. That night we watched the most famous Kathakali Dance show in the local theatre. Prince Charles & the Duchess of Cornwall came here too to watch the show during their visit to Kochi. Next morning we began our drive to Munnar.